So, I know everyone and there mother have reviewed La Roche Posay's Effaclar Duo and it's pretty much the talk of the blogosphere but I thought I'd air my views on it. I picked this up when my skin was going through a bit of an unusual time of breaking out quite frequently, I generally have extremely dry skin, one of the perks being that I rarely get spots, but for the past few months, I've been breaking out pretty much on my T-Zone and a little bit across my cheeks, I spotted the reviews for this and decided to give it a go, I searched high and low in boots and pharmacies around here before finding it online. Initially, I was worried that this would break me out as a few others mentioned that they initially had a big break out before they started seeing results, thankfully, I didn't get this, I did however buy this expecting miracle results overnight which didn't happen either so initially I was disappointed, but a few days later my skin started clearing and generally just looking a little bit more even in tone, It didn't eradicate all my spots immediately but I started using this every day in May, and within around a week, they were virtually all gone, I now use this once or twice a week and I haven't really had a spot since so I am 100% in love with this product, I do credit some other products for this as well (I've got separate reviews lined up but one being Superdrug's Vitamin E Hot Cloth Cleanser, Origins Clay Mask and Pukka Cleanse Tea) but I think this Effaclar Duo is definitely a big factor. I definitely notice my skin detoriating if I don't use this after a week so I try and use it twice a week now. This is a 40ml bottle which seems small initially for the price tag of £13 but a little goes a long way, I use around 3 pea sized amounts per application one for my forehead, one for my nose and across my cheeks and one for my chin and that seems to work for me, I've been using reguarly since the start of the year and I would estimate that I still have well over half left. My one negative is the scent, I know there's a floral scent trying to break through but to me it smells a bit like bad breath, it's definitely a really weird scent, it's not horrible, just weird. You can pick this up in most pharmacies that stick La Roche Posay for around £13. 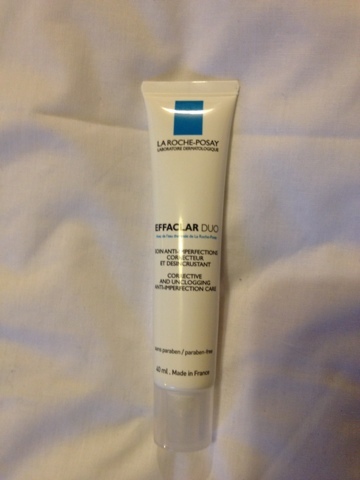 1 comment on "La Roche-Posay Effaclar Duo"
I officially love every LRP!